It was interesting to look at the foliage maps this week, as Scott had opportunity to drive through most of the coastal foliage areas yesterday, on the way to and from a speaking engagement in Blue Hill (the Blue Hill peninsula is just south of Mount Desert Island and Bar Harbor). The Yankee Magazine foliage map shows the Freeport area to be fading and the areas between Brunswick and Camden to be at peak, Camden to Bucksport to be just turning, and the Blue Hill peninsula to be at peak. As of this writing (Wednesday, October 21), the Maine foliage site hasn’t updated since the previous week. 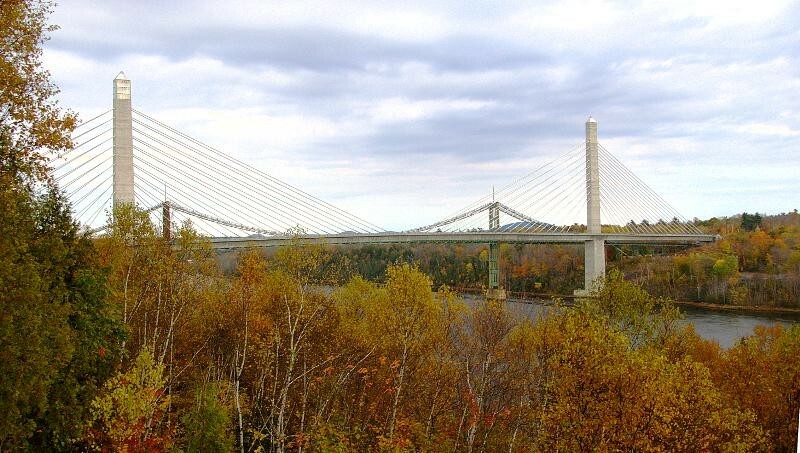 The accompanying photo of the Penobscot Narrows Bridge (the observation deck is at the top of the left tower), just before Bucksport on US-1 if you’re heading north, shows that area not yet at peak, which seemed to be the case all the way to the Blue Hill peninsula. While the recent winds and rain a few days ago have caused a good deal of leaf drop from Freeport to Camden, it certainly appeared to us that the best is yet to come from Freeport to Camden, and there seems to be a good bit of foliage yet to turn in the Camden to Blue Hill areas. All that to say, that while it probably won’t last more than another week between Freeport and Portland, there is a good amount of color yet to be had over the next couple of weeks as you drive the coast along US-1.